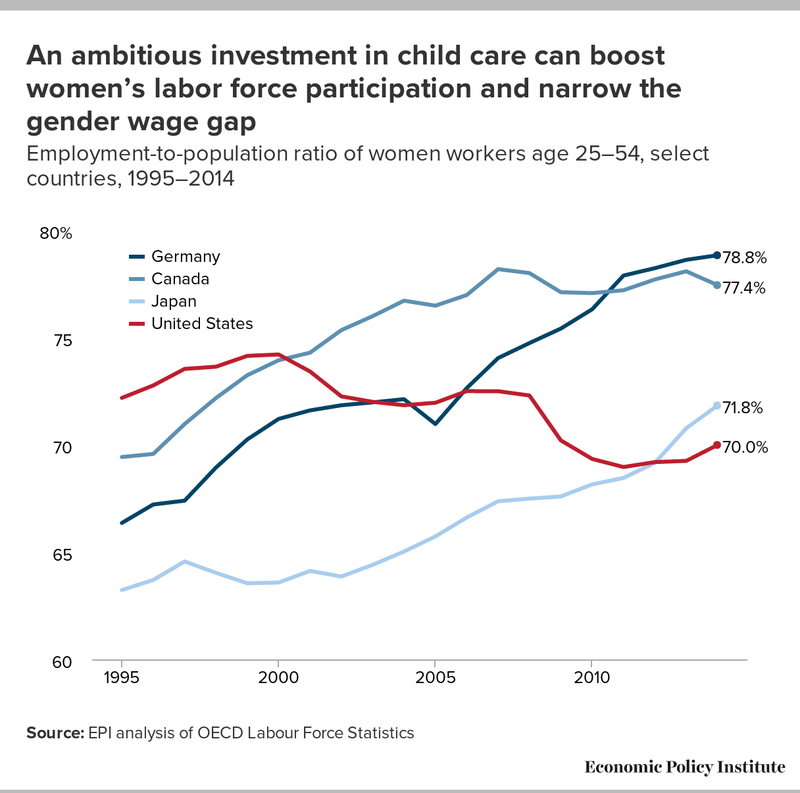 Ambitious investments in high quality child care can narrow the gender wage gap and help boost the economy by increasing women’s labor force participation. Examining the U.S. women’s labor force participation rate over time reveals that, while U.S. women have increased their labor force participation rate greatly in the last 50 years, there is still room for improvement, especially when compared with international peers. In 1995, 72.2 percent of prime-age women in the United States had a job. By 2014, this number had dropped to 70 percent after peaking at 74.2 percent in 2000. The share of women ages 25–54 with jobs in the United States in 2014 is also relatively low compared to peer countries like Japan, Canada, and Germany, where women’s labor force participation rose significantly over the last two decades. Making quality child care affordable and accessible would make it easier for women to enter or stay in the labor force. This would translate into a narrowing of the gender wage gap because it would help women avoid the penalties they incur when they take time out of the labor force to care for children, penalties which most starkly manifest as lost wages and lower future earnings. Increasing women’s labor force participation could also boost U.S. gross domestic product by as much as $210 billion, meaning that the United States has much to gain from investing in policies that give women the option to stay in or enter the labor force.